I have heard that song so many times, but yesterday, on my husband’s birthday, I heard it almost for the first time. As I listened I thought about how close I came to not marrying my husband, to missing my own life. I didn’t even want to go out with him after I found out he was in the Navy. At the time, he was a grad student at Stanford and I was living in Palo Alto on University Avenue, in the first apartment that was all mine. It was in an old Victorian house and my apartment had walls of windows, hardwood floors, and wainscoting. I adored it. I loved my job in investor relations, and finally, I lived close to my dearest friends in the world, who I ran with on Friday evenings in Huddart Park. So when the night of my first date with Scott arrived, I decided to clean my apartment instead. Why, I thought, would I waste time going out with someone in the Navy? I would never be a Navy wife. Of course, when I met Scott outside my apartment on the evening of our date, I regretted my decision to wear an old cardigan and a scarf around my head. There he was, lean and handsome, wearing cargo pants and a nice shirt, looking like a cross between Cary Grant and Owen Wilson. He was so tall I had to squint into the sun to see his face. And he was a gentleman. He ignored my appearance and we stayed out until after midnight, eating Vietnamese food and talking. I think about us then, the old us, back when we were still so new. So much has happened since then. Scott left Palo Alto for Philadelphia after graduation, nine months after I met him. I wanted to go with him and he broke my heart by telling me he didn’t want me to. I tried breaking up with him, but somehow, I let him visit me, and a few weeks later, I was on a red-eye to the east coast for a long weekend. This time, when he met me at baggage claim, he was wearing his khaki uniform, and I didn’t like how short his hair was. He reminded me of the serious-eyed photos they showed on the news of the young troops killed in Iraq. I, on the other hand, was out protesting the war, glaring at the SWAT teams that lined the streets of the Palo Alto anti-war demonstrations.I didn’t want to be a Navy Wife. In my head, Navy Wives wore pleated skirts and made meatloaf. They went to church every Sunday and played Bunko. I couldn’t even imagine myself in that role. And then, it all changed. I woke up 4:30 AM on March first, 2005, and knew I was pregnant. I had just had a dream that my ex-boyfriend from years ago jumped off a cliff, and I was certain. I ran out to the Palo Alto Safeway, bought three pregnancy kits, and then called Scott, sobbing. I wish I could say that it was the answer to my prayers. I wish I could say it was meant to be. But it wasn’t. It was hard. I wasn’t ready to be a Navy Wife and Scott wasn’t ready to be a father. We scheduled an abortion, and then, the night before, I changed my mind. I was only five weeks pregnant, but there was a light under my heart that was too bright to put out. There was something in me, the size of a question mark, that I could not bear to erase. For almost five months, I hid the pregnancy from my boss and my family, and then we got married in a small ceremony in Half Moon Bay. Six weeks later, I moved to the east coast, and three months after that, Oliver was born. As I drive my son to school on my husband’s birthday, the sun filtering through the leaves, golden and red and green, I can’t imagine any other way, any other story. I am a mother now. I am a Navy wife. (I still don’t play Bunko or live on a Navy base). I hope I am a softer person, more kind than I used to be. Every day, I make so many mistakes. But still, I am here, in a house with so many rooms that are still not as many as all of the new rooms that now exist in my heart. I never thought I would be living this life. How could I have not imagined this life? God only knows what I’d be without you. Scott delights and infuriates me, he is patient with me, he – more than anyone – has tolerated the messy and awkward and scary process of growth. He has grown. Our sons have grown into two little boys who now who help each other pile acorns into toy dump trucks and try to sit on the same pumpkin. They pull each other’s hair and scream so loudly I can barely stand it some days. We eat dinner together, we light candles and say blessings. We give our children baths, which once I thought was the most romantic prospect: bathing the sweet skin of your child. Now, Scott and I flip a coin over who is going to do bedtime, who is going to clean up the kitchen, take out the trash. Life is like that. As beautiful as it is, there is still the trash, the dust in the corners, the overdue library books. Today, I took the boys to a supermarket to buy their father presents. From Gus, the baby, came a 30th Anniversary bottle of Sierra Nevada. Oliver picked out fruit snacks, the forbidden kind I only allow into the house on special occasions. They each picked out a balloon for their dad. Gus picked out a baseball balloon and Oliver picked out one with a dump truck on it. Perfect, I thought until we watched Gus’ balloon wrestle free from its string in the parking lot and bound up into the sky. There we go, I thought. Just that quickly we are gone. 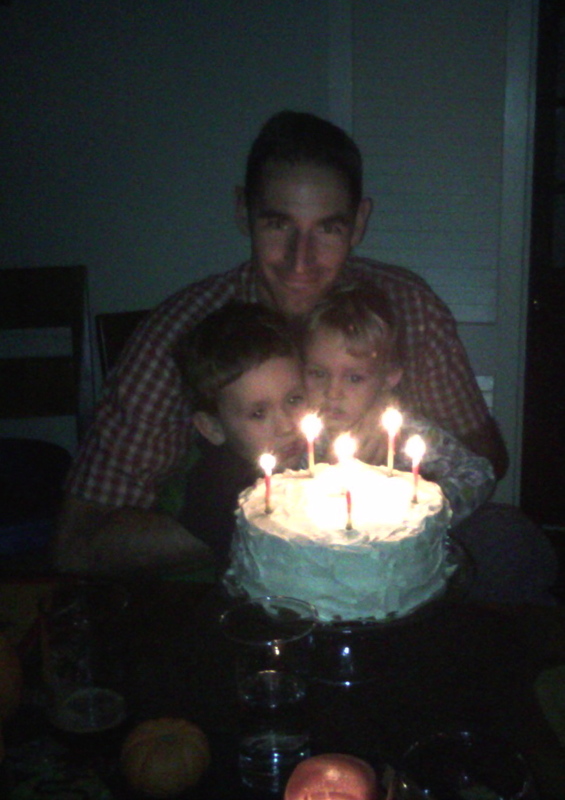 Tonight, Scott blew out candles. We were 30 together once and now we are 38. We all had too much cake and now I have a canker sore on my tongue. Too much sugar. A day of just sweet. A day of candles, flickering in the darkness. There should definitely be more days like this. Certainly more than one in every three hundred and sixty-five. You are currently reading God Only Knows What I’d Be Without You at Walking on My Hands.